The daughter of an oenologist, Giovanna Morganti studied oenology and then began working for San Felice, where she focused on preserving some 300 old Tuscan grape varieties. When her father gave her the three-hectare Podere le Boncie, an olive-growing estate in Castelnuovo Berardenga, Giovanna created a vineyard, populating it with Sangiovese and her favourite old varieties – Ciligiolo, Foglia Tonda, Mammolo and Prugnolo – planted very densely (7,000 vines per hectare). She has since acquired another 1.3 hectares nearby. The farming is mostly biodynamic. Fermentation, with indigenous yeasts, takes place in traditional open-topped wood tanks. Two wines are produced: the flagship Le Trame and a “second” wine, Il Cinque, a young-vines cuvée that was originally sold only at the winery. Located in Carmignano, Italy’s smallest wine appellation and one of its oldest (granted special protections as far back as 1716), Fattoria di Baccherto has been in the hands of the Tesi family since 1920. Currently run by Rossela Bencini Tesi, the estate is centred around a former Medici hunting lodge. In 2001, unhappy with the quality of her wines and the condition of her soil, Rossela switched to natural wine-making: organic and eventually biodynamic farming, no additions in the cellar other than a tiny shot of sulphur dioxide at bottling, spontaneous fermentations, no temperature control, no filtering and no fining. 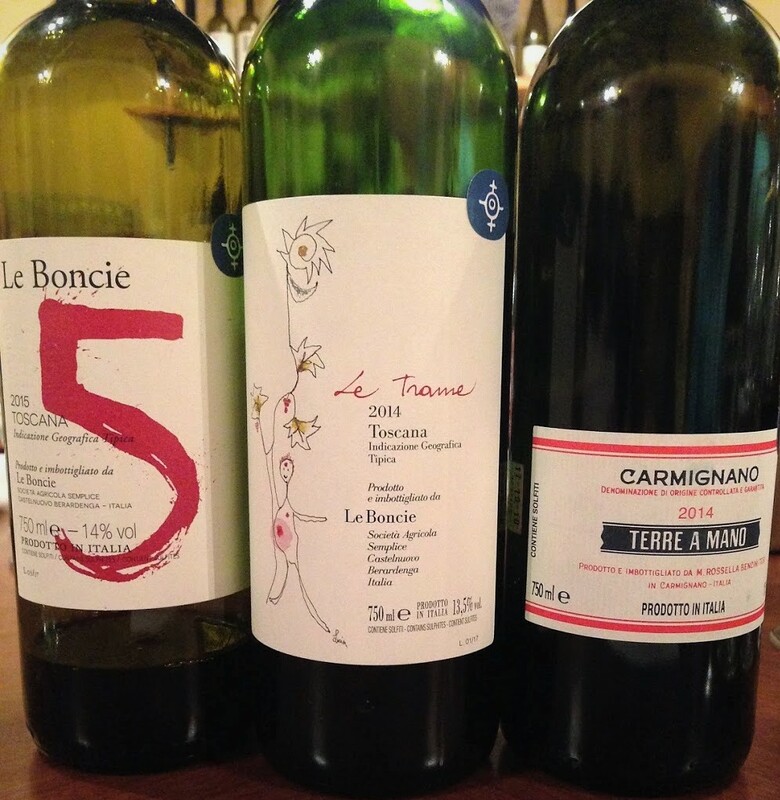 Sangiovese, Cabernet Sauvignon (long present in the appellation and possibly introduced in the 16th century by Catherine de’ Medici), Canaiolo, Trebbiano Toscano and Malvasia del Chinati are the main grape varieties. Annual production is around 10,000 bottles of red wine, 2,000 bottles of white wine and 1,000 bottles of vin santo as well as olive oil, honey and figs. Sangiovese (70%) with Mammolo, Colorino, Foglia Tonda and Ciliegolo making up the balance. Manually harvested. Destemmed. Fermented with indigenous yeasts in stainless steel tanks. Matured 12 months in barrels and six months in the bottle. Unfiltered and unfined. 14% ABV. Quebec agent: oenopole. 75% Sangiovese, 10% Canaiolo Nero, 15% Cabernet Sauvignon from vines planted in 1979, 1994 and 2004. Manually harvested. Destemmed. Alcoholic fermentation takes place in glass-lined concrete tanks and lasts 15 days. The wine is then transferred to used 350-litre Allier oak barrels for malolactic fermentation and maturation, typically lasting 18 to 24 months. Unfiltered and unfined. 13.5% ABV. Quebec agent: oenopole. Sangiovese (90%), Foglia Tonda, Colorino and Mammolo (10% combined) from vines averaging 20 years old. Manually harvested. Destemmed. Fermented 20 days in small wood vats with indigenous yeasts and twice-daily punch-downs. Matured 26 months in large barrels and six months in the bottle. Annual production: around 6,000 bottles. 13.5% ABV. Quebec agent: oenopole.